The visit of the nuclear-powered guided missile cruiser Texas sparked anti-nuclear rallies on land and sea. Port visits by United States warships had been controversial for a number of years. Two nuclear-powered cruisers, USS Truxtun and Long Beach, had attracted protest when they visited New Zealand in 1976. On each occasion, Civil Defence established a public safety headquarters for the duration of the visit. Similar action was taken for the visits of the submarines USS Pintado in 1978 and Haddo in 1979. At issue was whether these ships were nuclear-armed as well as nuclear-powered. American policy was to ‘neither confirm nor deny’ the presence of nuclear warheads and other weapons, and most US allies chose not to ask – an arrangement that an increasing number of New Zealanders began to question. Nuclear ship visits became an election issue in 1984 and David Lange’s Labour government later banned them. 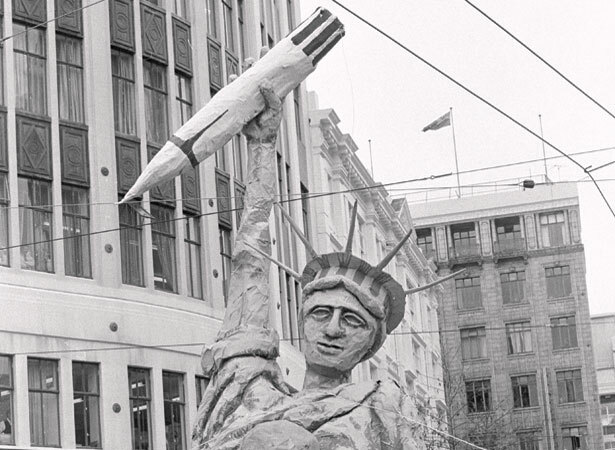 This policy, which led to New Zealand's effective exclusion from the ANZUS alliance, was later confirmed in law by the passage of anti-nuclear legislation in 1987 (see 8 June). We have 6 biographies, 8 articles, related to Protest as USS Texas visits Auckland.